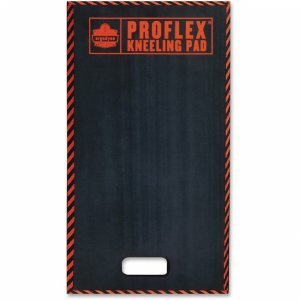 ProFlex 385 Large Kneeling Pad delivers comfort in static kneeling situations for larger worksurfaces. The closed-cell foam is nonconductive, resistant to petroleum and silicone-free. Beveled safety edge features orange warning stripes. Convenient handle allows hanging storage. Knee pad is great for use in plumbing/HVAC, mechanics, utilities, electricians, flooring, landscaping and carpentry.